The bathroom market is very competitive with a huge number of retailers bidding for a slice of this multi-million-pound industry. Within North Wales competition is rife, with bathroom showrooms popping up and in many cases closing long before the manufacturers warranties expire. It appears showrooms are taking a ‘me too’ approach, playing it safe by displaying an almost generic range of products. Unfortunately, we’ve been guilty of this too! Whilst choice, design and service has seen us outlive numerous competitors since our inception in 1956, we can’t stand still. We must be the bathroom showroom others aspire to and that customers desire to shop in. With this in mind we are quietly undertaking a rebirth, with a new team, new suppliers and a whole new showroom. The simple white basin and toilet remains a staple of UK bathrooms and we will offer the finest quality available. Products you will run your hands over with a reassuring confidence that castings are true, glazes are smooth and designs are eye catching, however, as a destination showroom, we want to offer more to our future customers. Products that are unique to the area and styles that North Wales is often left wanting when reading the latest home interiors magazines. Read on to find out more on the latest fashions and newest brands that we are currently focusing on. Country Chic: A prominent style for the UK market is the combination of wood finishes, soft colour palettes and hand painted detailing. Industrial heritage and country living are engrained in British history, however with innovative designs these bathrooms are far from ‘traditional’, in terms of functionality. 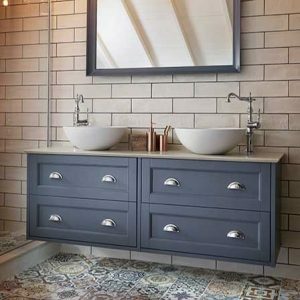 The industrial revolution: Iron, wood, exposed brickwork, pipes and grunge details have never felt more at home in the bathroom. The desire to replicate industrial architecture over the last few years has proven to be the generator of irreproachable philosophies in style and has been met with increasing demand. By skillfully blending contemporary elements with classic details, we can create unique spaces with a strong sense of character. Each of our brands has been carefully chosen, to ensure we have a wide variety of products as well as the very best quality in design and manufacturing. Below is a brief introduction to our headline brands. Laufen: Founded in 1892 in Switzerland, Laufen has become one of the world’s leading companies for bathroom products, manufacturing around 4.5 million ceramic pieces per year exclusively in central Europe. Swiss Quality – all Laufen products are manufactured to the optimum level of Swiss quality, achieved by using the highest specification of materials and the latest technology. Laufen products being carefully handcrafted to the finest standards of workmanship, has resulted in them being renowned for their reliability, finish and attention to detail. Award winning Design – Laufen’s bathroom collections are created by the world’s leading designers. Their flair and passion have produced solutions that are unique, dynamic and eye-catching, which has led to Laufen winning the latest design awards. With Laufen you are assured to find a bathroom collection to meet your requirements. With classic, contemporary and ultra-modern ranges you will be able to meet any aesthetic needs. Villeroy & Boch – For 270 years, Villeroy & Boch have been bringing sophistication and style to people’s lives with innovative, high-quality products. Timeless elegance, innovative design and outstanding quality, is what Villeroy and Boch have stood for since 1748. Designers and project managers develop collections and concepts based on this tradition that shape living environments. These products distinguish themselves though noble impression, intuitive manageability and long-lasting quality. Dornbracht – Culturing life. Dornbracht represent the very highest quality of manufacture, progressive production and innovative design. The premium fittings of this family company have won numerous international awards, acting as a driving force for the developments and trends of the entire industry. For over 60 years Dornbracht have focused on change, changing water. The way it feels, its shape, its performance and the overall wellness it delivers to the user. BagnoDesign – Expertly Crafted Bathrooms. 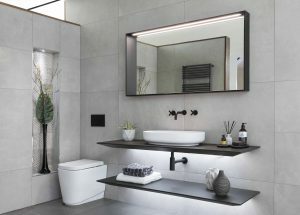 The latest products from Bagno Design ensure that the bathroom is a place of relaxation, comfort, rejuvenation combined with luxury and quality, down to the very finest detail. Bagno Design products feature in some of the world’s most iconic buildings and luxurious hotels – From the World Trade Centre in Abu Dhabi to the Palazzo Versace Hotel and more locally the Doubletree Hotel in Chester. The reason Bagno Design products are so widely sought after in such vast projects, is due to their clever thinking and trend setting solutions. Using a variety of materials and unrivalled choice of colour finishes, it enables us to create the most unique and desirable space.